Hotel Eastlund suites feature a California king bed with a large living area that can be separated by a sliding wall. Suites also include a smart refrigerator, phone and alarm clock with stop/snooze smart technology during the night, a Keurig coffeemaker, 48″ smart HD TV with premium channels, USB outlets with charging cables on the nightstand and desk, down pillows and blankets with top-of-the-line linens, security safe, and a spacious, modern bathroom with dual sinks, and a walk-in shower, iron and ironing board. 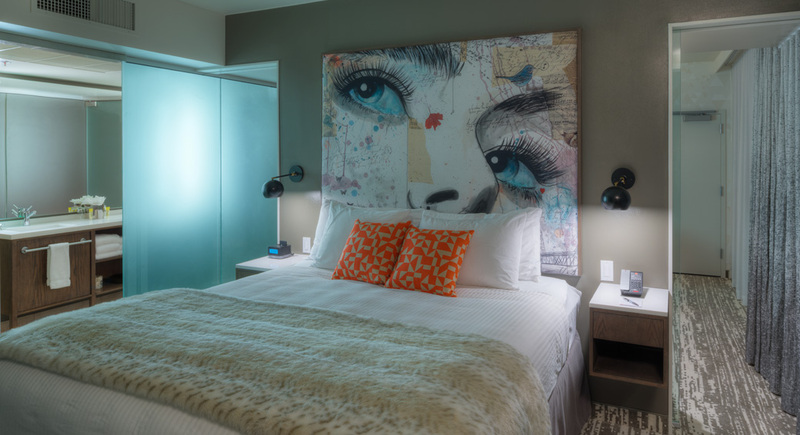 Our suites are designed to bring comfort and luxury to your home away from home! Premier suites are approximately 560 square feet. Junior suites are approximately 390 square feet. Premier Downtown Suites (approximately 560 square feet) offer sweeping views of the downtown skyline from our floor-to-ceiling windows with a California king bed (72″x 84″), down pillows and blankets, a 48″ smart HD TV, smart refrigerator, Keurig coffee maker, security safe, USB charging ports at the desk and nightstand, and a luxurious modern bathroom with dual sinks, and walk-in shower. Junior Downtown Suites (approximately 390 square feet) offer sweeping views of the downtown skyline from our floor-to-ceiling windows with a California king bed (72″x 84″), down pillows and blankets, a 48″ smart HD TV, smart refrigerator, Keurig coffee maker, security safe, USB charging ports at the desk and nightstand, and a sleek modern bathroom with a warm gray glass tile walk-in shower. Accessible Downtown Suites (approximately 560 square feet) offer panoramic views of the downtown skyline from our floor-to-ceiling windows with a California king bed (72″x 84″), down pillows and blankets, a 48″ smart HD TV, smart refrigerator, Keurig coffee maker, security safe, USB charging ports at the desk and nightstand, and a luxurious modern bathroom with dual sinks and walk-in shower. Accessible Junior Downtown Suites (approximately 390 square feet) offer sweeping views of the downtown skyline from our floor-to-ceiling windows with a California king bed (72″x 84″), down pillows and blankets, a 48″ smart HD TV, smart refrigerator, Keurig coffee maker, security safe, USB charging ports at the desk and nightstand, and a sleek modern bathroom with a warm gray glass tile roll-in shower.